Flattering, luminous colour, full of highlights. Up to 100% grey coverage, less visible re-growth. Replenished hair, full of body & shine. Easy application brush.Layered tone crème colour. 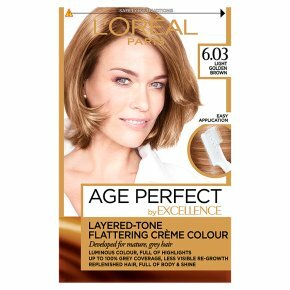 Our 1st hair colour perfectly designed for mature, grey hair. Specifically developed for sophisticated, up to 100% grey coverage. The rich crème beautifully blends both grey and natural hair, creating highs and lows as if highlighted. The result? Root re-growth is less visible and elegantly blended with the rest of the hair. Enriched with Pro-Collagen and Pro-Ceramide. Hair feels replenished, protected and smooth.